We have been ridiculously busy over the last 6-8 weeks, we moved house and My Food Baby and I went on her first trip back to the UK, along with all the other pressures of daily life with 2 boisterous girls at home. I struggled to find time to do things at home, like properly unpack my clothes, and unfortunately my blog has suffered. But we are home, and I am determined to write all the posts I draft in my head! I still owe someone a recipe for something that I can no longer remember what it was for 😦 remind me if you do! 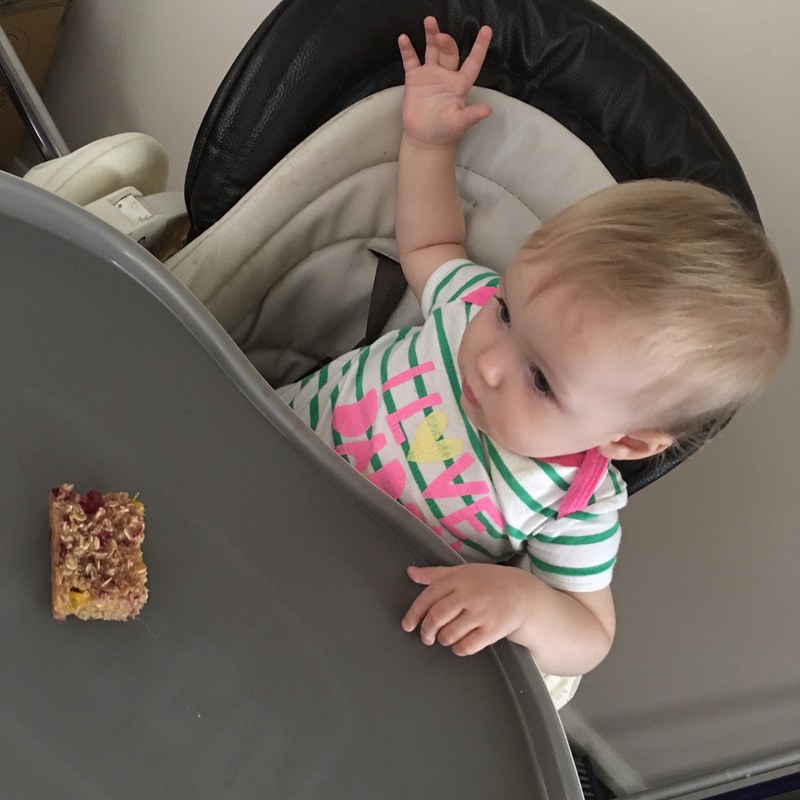 Anyway to the Porridge Squares – I have seen a few variations of these on other instamummy pages and have been determined to buy some oats. I need to be more adventurous and get out of my shopping / cooking cycle which can be pretty mundane. These always appear yummy, healthy and convenient – what more could you want from your food?! 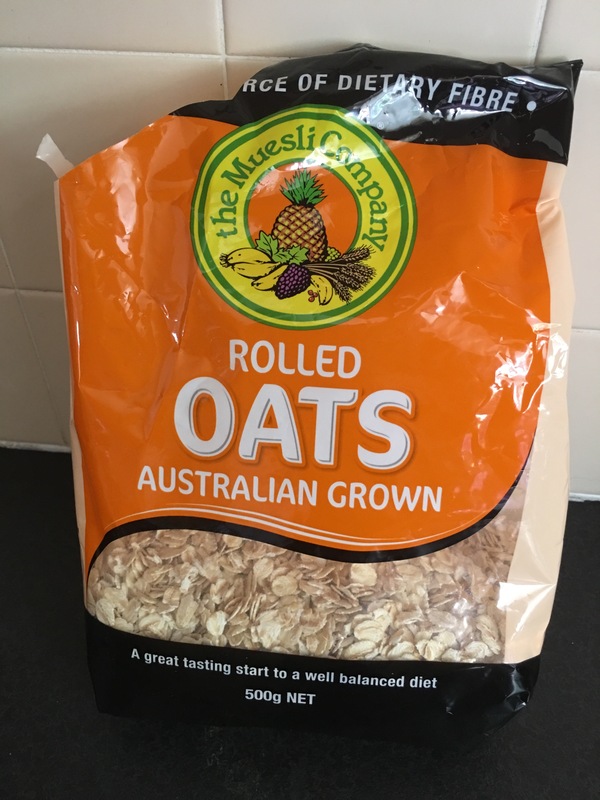 So yesterday I went to the supermarket, picked up bag of rolled oats and got onto Google. 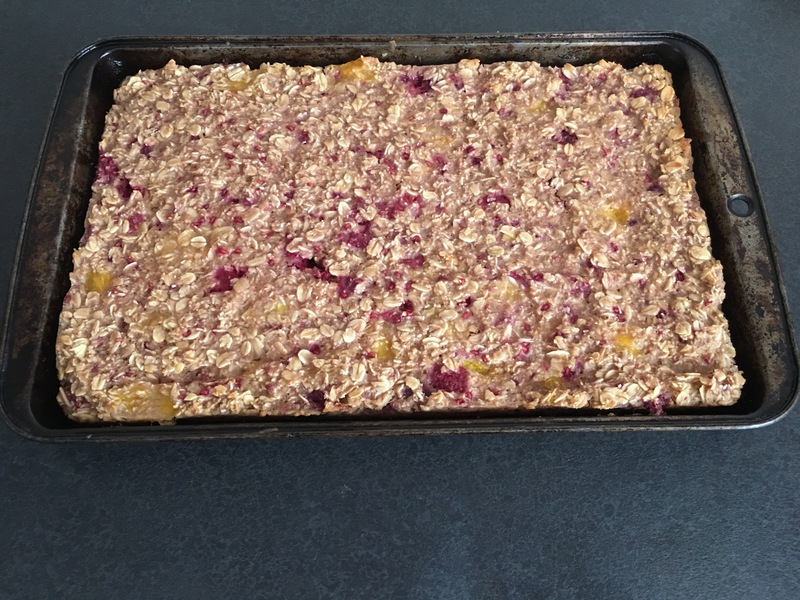 The recipe I based my squares on was from http://www.liviaskitchen.co.uk but I adapted it to accomodate what I had at home. Preheat oven to 180 degrees C. Grease a brownie tray with a little coconut oil. Mix all ingredients in a large bowl and stir until combined, use the (wooden) spoon to squash the raspberries and break up the mango chunks a little. 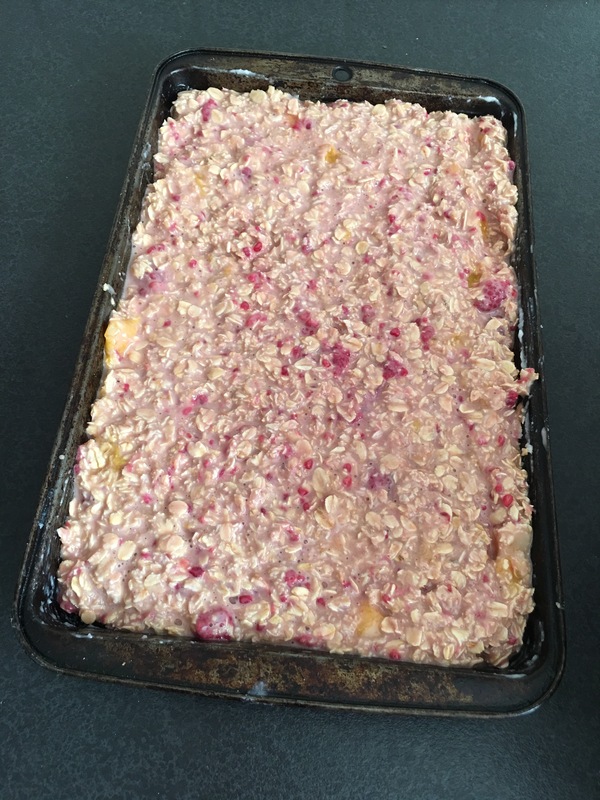 Pour mixture into baking tray and bake for 20 minutes or until the middle is no longer runny. 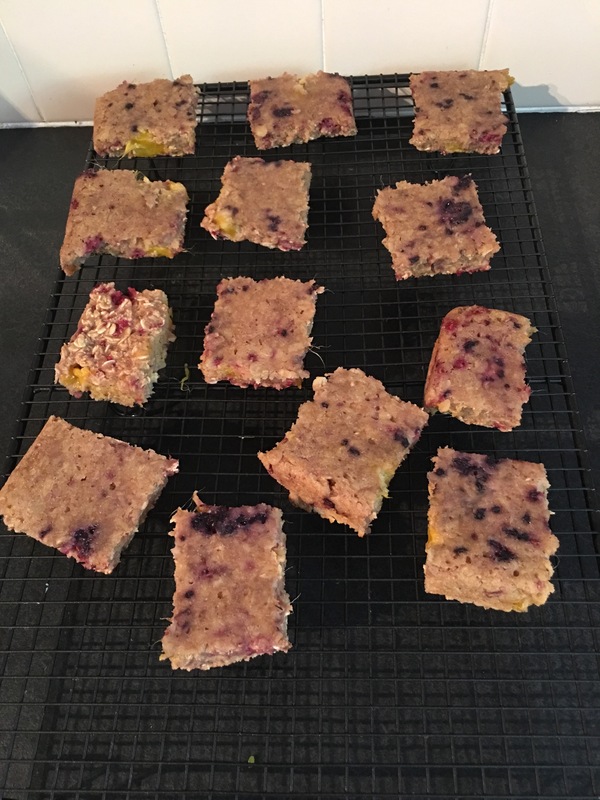 Remove from oven and leave to cool for a few minutes, cut into squares and then allow to finish cooling on a wire rack until. Tip: place squares ‘upside down’ on the rack as the bottom may be a little soggy. Store in an airtight container in the fridge for about 3 days (if they last that long). Because I used frozen fruit there was extra liquid in his recipe. Next time I might play with reducing the amount of milk but 10-20 mls. I think this recipe could also have many different additions / sunstitutions, I’m thinking of adding some shredded coconut next time as I think that would be really tummy with the mango.